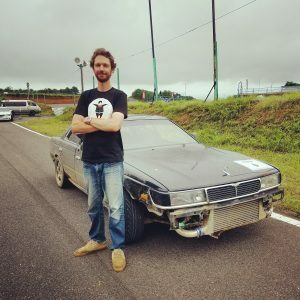 Welcome to DriftInJapan.com! I’m Stu Stirling a.k.a. Disco Stu. Drifting is not just a hobby, it’s a way of life. Here’s my story. It all started in 2005 when I moved to Nihonmatsu city, Japan. 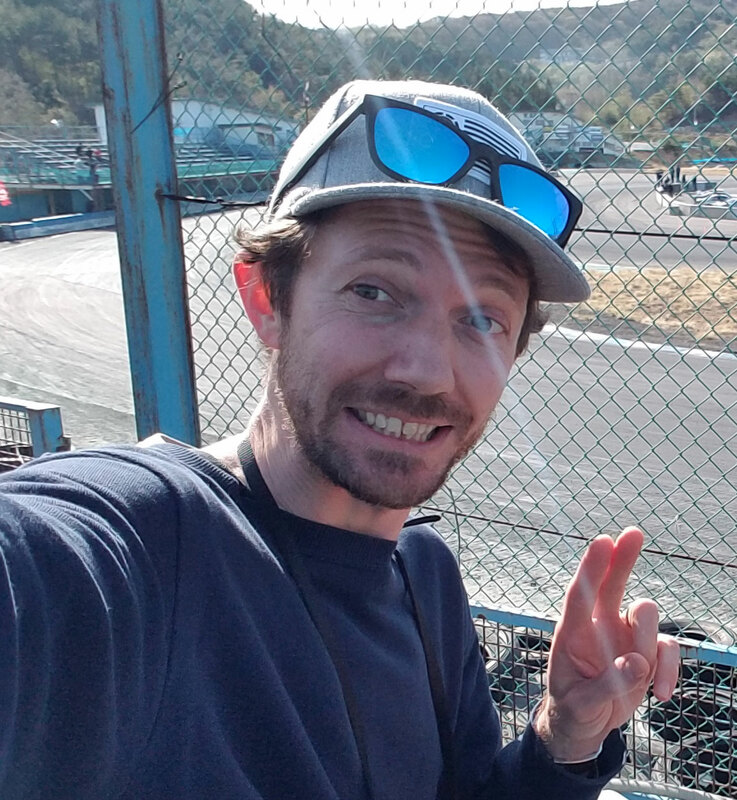 I was living with my wife in her parent’s home, which is a mere 7-minute drive from the world famous Ebisu circuit! I had heard about Ebisu at that time but I didn’t know just how famous and awesome this place was until after I got into the drifting scene here, and then I really saw that Ebisu is the #1 venue for drifting in the world. 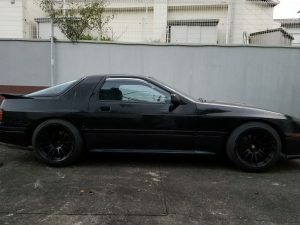 My first drift car in Japan tha cost me US$500. An NA S13 Silvia Qs. 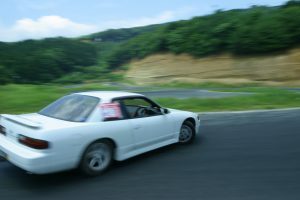 My first drift car was a white NA s13 Silvia which I found in a local car yard and bought for 50,000 yen (Around US$500). Remember, this was in 2005 when S chassis’ were plentiful and cheap here in Japan! The only mods I did to that car was cut the stock springs. It had an LSD of some sort when I bought it. Albeit low-powered, it was a cheap, turn-key practice car. She served me well for a couple of years but I stopped using it when I got my black A31 Cefiro, so it sat in the East car park for a while and sadly had some parts robbed from it so I didn’t bother fixing it. Eventually, I handed the keys over to Chris Dejager who got her going again and it became the missile of missile drift cars. My RB20DET Cefiro. When it still looked like a Cefiro. 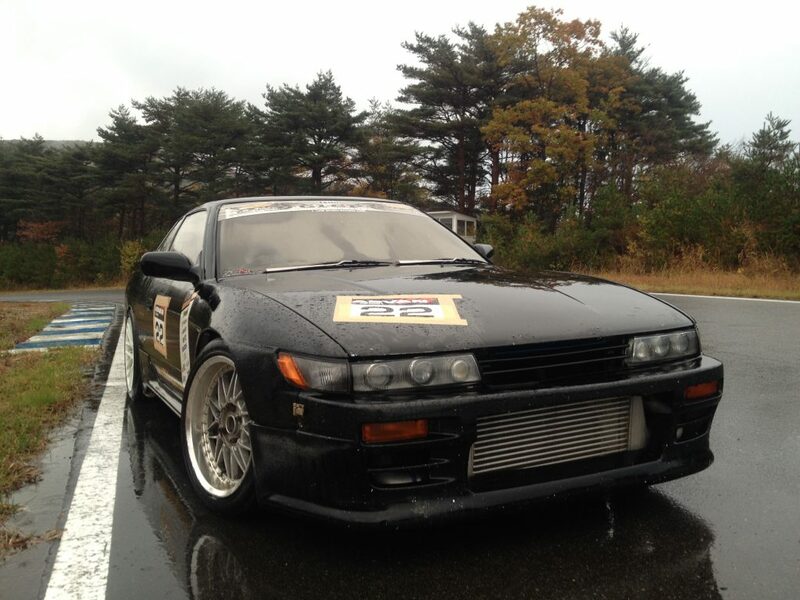 My next drift car was a RB20DET Cefiro which I bought off a friend for an absolute bargain of 10,000 yen (US$100!). Crazy, I know. He knew I wanted a turbo car so he offered me his unused A31 to me. It had an exhaust, was a factory 5 speed manual and has the RB20 turbo engine. Lucky as I am, I found a A31 parts car in Fukushima city that had a Nismo LSD, Bride reclining buckets and other bits for 30,00 yen (US$300). So now I had a working turbo drift car. That Cefiro was an unreal, ultra reliable drift car. It was running on stock boost so it didn’t make crazy power but was enough to drift the courses and have a ball at Ebisu. Even though I only changed the oil it about once a year, it never missed a beat. Unfortunately, after several battle practice sessions with Andy and Emily from Powervehicles and Chris Dejager, it got knocked around and started to look less like a Cefiro after every session. My 350ps S13 Silvia. My G1Gp comp car in 2009/2010. I wanted something new and fresh. By this time, circa 2009, Ebisu circuit and Drift Matsuri had become a huge sensation around the world and Powervehicles was in full swing – operating inside of Ebisu and stocking drift cars up to their eye-balls, so I bought another S13 from Andy and Emily from Power Vehicles. This time, this one was well-tuned with a Apexi turbo, Apexi cams, injectors, re-mapped ECU – and it had a clean, straight body! I added some wider wheels, stronger tie-rods and rack-end spacers and she was great! By far the best drift car that I’d had until that time. I entered in a couple of G1Gp contests with this car in 2009 and 2010. I didn’t get on the podium, but had a blast all the same. In 2010, my wife and I welcomed our first child into our lives. You can guess what happened after that. I told everyone that I wouldn’t give up drifting and it’d all be the same – we would have our usual Sunday sessions, BBQs and beers! Ahh well, it didn’t pan out that way. I ended up selling my black S13 and Cefiro to Andy and a whole bunch of wheels and other parts to a mate. In 2012, we had our second child, and a third in 2015. My drifting ‘career’ would quickly turned into an occasional hobby. Family responsibilities took priority. Of course, my wife and kids are everything to me and I wouldn’t trade them for the world. But that’s life. If you know of a way to do drifting every weekend, raise kids and keep the missus happy, let me know! My trusty C33 RB25DET Laurel that I entered in 2017 Summer G1GP. Don’t get me wrong though! The drifting bug is still alive and kicking inside me and I visit Ebisu at every opportunity I get – even just to pop in and say G’day to Andy, Emily and Kumakubo, Suenaga etc. I even occasionally get asked for assistance for interpreting at drifting lessons or at events. I even still have a couple of drift cars! I have a C33 Laurel that is a great basic practice car with all the usual bits. I entered that car in the Summer G1Gp competition last year on West course. My other drift car is a work in progress – a FC Rx-7 which is one of my favorite cars of all time. I’m actually a real rotary fan at heart! Please subscribe to my Youtube channel too so you can keep up with my drifting antics! So that’s me. I’m ‘Disco Stu’, an Aussie living in Nihonmatsu, Japan since 2005. Ebisu circuit is my playground and drifting is my passion. Stick around for news, info, event coverage and other cool things I have to share. Firstly, wonderful website and blog. I am coming to Japan/Tokyo with my younger brother. We are both car enthusiasts and always wanted a full day or two lesson at a drift school. I am unable to find anyone to teach us to drift. We are flying into Tokyo from long and far away and want to do the course. Team orange is apparently unavailable. We are willing to pay good dollars for the course. Can you help me in anyway? March 6 7 or 8 is when I am looking for. please help.